Follow the quest of Curtis Newton, wizardman of science, as he scours the worlds of tomorrow in the hunt for the greatest interplanetary outlaw of all time! The Captain Future saga follows the super-science pulp hero Curt Newton, along with his companions, The Futuremen: Grag the giant robot, Otho the android, and Simon Wright the living brain in a box. Together, they travel the solar system in series of classic pulp adventures, many of which written by the author of The Legion of Super-Heroes, Edmond Hamilton. 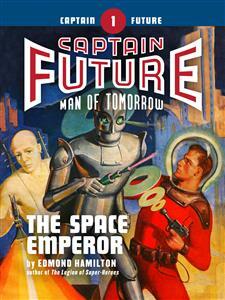 “The Space Emperor” was originally published in 1940. No part of this book may be reproduced or utilized in any form or by any means, electronic or mechanical, without permission in writing from the publisher. THE chill, uncanny breath of a dark menace millions of miles away pervaded the spacious, softly-lit office high in the greatest of New York’s mighty towers. The man who sat there at an ebonite desk was worried. Facing a broad window which framed the stupendous pinnacles of the moonlit city, he could feel that cold, malign aura. He shuddered at the thought of what he knew was happening even at this moment. James Carthew, President of the Earth Government which had ruled all humanity since the last World War, was not an old man. Fifty was considered the prime of life, in these days. But the appalling responsibilities of guiding the destinies of all mankind had aged this man before his time. His gray-short hair was thinning around his high forehead. There were deep lines of strain in his keen, powerful face, and his dark eyes were haunted by haggard weariness and lurking fear. As the door of his office opened his thin hands gripped the edges of his desk convulsively. North Bonnel, his slender, dark young secretary, entered. A scream from somewhere in the lower levels of the great Government Tower cut him off. It was a woman’s scream. There were many girl clerks employed here in the huge Government Headquarters for Earth and its planet colonies. Even at night, some of them were always in the building. But what had frightened one of them into uttering that agonized scream? James Carthew had risen to his feet behind his desk, his aging face paling with sudden apprehension. The secretary started violently. He started toward the door. It was suddenly flung open from outside. In the open door stood a hideous and incredible figure, a monstrosity out of a nightmare. It was a giant, hunched ape, hairy and abhorrent. Its squat figure wore a man’s zipper-suit of white synthesilk. In the too-tight garment, the creature looked like a gruesome travesty on humanity, its brutish, hairy face a bestial mask, jaws parted to reveal great fangs. Its eyes blazed with a cold glitter as it started into the room. “Look out!” Bonnel yelled frantically. A WHITE-FACED guard in the dark uniform of the Planet Police appeared in the door. He leveled his flare-gun swiftly at the monstrous ape. “Wait—don’t shoot!” James Carthew cried suddenly, as he looked into the monster’s hairy face. His warning was too late. The guard had seen nothing but an incredible, menacing creature advancing toward the President. He had squeezed the trigger. The little flare from the pistol struck the ape’s broad back. The creature’s bestial face contorted in sudden agony. With a deep, almost human groan, it collapsed. James Carthew, with a cry of horror, jumped forward. His face was paper-white as he bent over the creature. The ape’s eyes, strange blue eyes, had a dying light in them as they looked up at the President. The creature strove to speak. From the hairy throat came a hoarse, gurgling rattle—dying words, thickened to a brutish growl, but dimly recognizable. “Jupiter—the Space Emperor—causing atavism—” the thing gasped hoarsely in dying accents. It sought to raise its head, its fading blue eyes weirdly human in agonized apprehension and appeal as they looked up at the President. And then, as it sought to form another word, life ebbed swiftly, and the creature sank back, its eyes glazing. “Dead!” Carthew exclaimed, trembling violently. “It’s not an ape. It’s a man!” said James Carthew hoarsely. He got to his feet. Guards and officials were running alarmedly into the office. “Get out—all of you,” Carthew whispered, making a gesture with his trembling hand. Horrified, still staring at the monstrous, hairy corpse on the floor, they withdrew and left the President and his secretary alone with the macabre corpse. “Good God—those blue eyes—it couldn’t be Sperling!” cried the shuddering young secretary. The pale young secretary looked beseechingly at his chief. Bonnel blanched at the hideousness of the suggestion. The President looked down at the hairy body that a few weeks before had been the keenest, most stalwart man in the whole force of the Planet Police secret agents. HASTILY, the young secretary searched the clothing of the hairy creature. He uttered a little exclamation as he drew forth a paper. Ship only one day from Earth, but feel myself changing so fast, I fear I won’t be able to talk or think clearly by then. Was stricken by the atavism on Jupiter, days ago. Tried to get back to Earth to report what I learned, before I became completely unhuman. I’ve learned that the blight on Jupiter is being caused by a mysterious being called the Space Emperor. Don’t know whether he’s Earthman or a Jovian. How he causes this doom, I don’t know, but it is some power he uses secretly on Earthmen there. I felt nothing of it, until I noticed myself changing, becoming foggy-minded, brutish. The young secretary’s eyes had horror and pity in them as James Carthew read the last words. James Carthew was feeling the awful weight of his responsibility, in this moment. The nine planets from Mercury to Pluto had entrusted their welfare to his care. And now he felt the approach of a mysterious, dreadful peril, a dark and un-guessable horror spreading like subtle poison. The first reports of the blight had come from Jupiter, weeks before. Out on that mightiest of planets, whose vast jungles and great oceans were still largely unexplored, there flourished a sizable Earth colony. Centering around the capital of Jovopolis were dozens of smaller towns of Earthmen, engaged in working mines, and timbering, and in great grain-growing projects. From one of those colonial towns near Jovopolis had come the first incredible reports. Earthmen—changing into beasts! Earthmen inexplicably being transformed into ape-like animals, their bodies and minds becoming more brutish each day. A horrible retracing of the road of human evolution! The victims had become atavisms—biological throwbacks hurled down the ladder of evolution. Carthew had hardly believed those first reports. But soon had come ample corroboration. Already hundreds of Earthmen had been stricken by the dreadful change. The colonists out there were becoming panicky. Carthew had sent scientists, men skilled in planetary medicine, to fight the horrid plague. But they had been unable to stop the cases of atavism, or even learn their cause. And neither had the secret agents of the Planet Police been able to learn much. Sperling, ace agent of them all, had learned but little, despite his sacrifice. “But if Sperling, our best agent, couldn’t succeed, who in the world can?” Bonnel cried. JAMES CARTHEW went to the window and stepped out onto the little balcony. He looked up at the full moon that sailed in queenly splendor high above the soaring towers of nighted New York. There was a look of desperation in the President’s aging, haunted face as he gazed up at the shining white face of the lonely satellite. “Very well, sir,” acceded the secretary, and went to the televisor. He came back a little later to the balcony, where James Carthew was gazing in anxiety toward the moon. “The flare is being set off at the North Pole” he reported. They waited, then, in tense silence. An hour passed—and another. The uranium clock showed it was past midnight. Far out beyond New York’s towers, the moon was declining from the zenith. They could see the distant rocket-flash of liners taking off from the spaceport for far Venus or Saturn or Pluto. James Carthew’s gray head lifted. “As a matter of fact, I’m here now, sir,” said a deep, laughing voice. It came from the balcony outside the window. A big, redheaded young man had miraculously appeared there, as though by magic. “Curt Newton—Captain Future!” cried the President eagerly. CURT NEWTON was a tall, well-built young man. His unruly shock of red hair towered six feet four above the floor, and his wide lithe shoulders threatened to burst the jacket of his gray synthesilk zipper-suit. He wore a flat tungstite belt in which was holstered a queer-looking pistol, and on his left hand was a large, odd ring. This big young man’s tanned, handsome face had lines of humor around the mouth, crinkles of laughter around the eyes. Yet behind the bantering humor in those gray eyes there lurked something deep and purposeful, some hidden, overpowering determination. A weird shape had just leaped onto the balcony. It was a manlike figure, but one whose body was rubbery, boneless-looking, blank-white in color. He wore a metal harness, and his long, slitted green unhuman eyes peered brightly out of an alien white face. Following this rubbery android, or synthetic man, came another figure, equally as strange—a great metal robot who strode across the balcony on padded feet. He towered seven feet high. In his bulbous metal head gleamed a pair of photoelectric eyes. The robot’s left hand carried the handle of a square transparent box. Inside it a living brain was housed. In the front of the case were the Brain’s two glittering glass lens-eyes. Even now they were moving on their flexible metal stalks to look at the President. THE name of Captain Future, the supreme foe of all evil and evildoers, was known to every inhabitant of the Solar-System. That tall, cheerful, red-haired young adventurer of the ready laugh and flying fists was the implacable Nemesis of all oppressors and exploiters of the System’s human and planetary races. Combining a gay audacity with an unswervable purposefulness and an unparalleled mastery of science, he had blazed a brilliant trail across the nine worlds in defense of the right. He and his three unhuman comrades, the living Brain, the metal robot and the synthetic man, were the talk of the System. Everyone knew that the scientific wizards’ home was in some obscure crater on the desolate moon. People looked up at the lunar orb at night and felt safer because they knew that Captain Future was there, watching and ready. They knew that should any sinister catastrophe threaten the System, he would come forth to combat it. But who was Captain Future? What had been the origin of his trio of unhuman comrades? And how had he come to achieve his super-scientific powers? That was a story that only the President knew. And it was perhaps the strangest story in the history of the Solar System. Twenty-five years before, a young Earth biologist named Roger Newton had dreamed a great dream. His dream was to create life—artificial, intelligent living creatures who would be able to think and work to serve humanity. He had already made great strides toward that goal, and felt on the verge of success. But a certain unscrupulous politician with sinister ambitions had heard of Roger Newton’s potent discoveries. He had made several daring attempts to steal them. There was danger to humanity if those discoveries passed into such hands. So Newton decided to seek a safe refuge in which he could work secretly. On a night in that June of 1990, the young biologist communicated his decision to his only intimates, his young wife Elaine, and his loyal co-worker, Simon Wright. Restlessly pacing the big, crowded laboratory of their secluded Adirondack farm, his red hair disordered and his lean, sensitive young face and blue eyes worried, Roger Newton addressed them. “But where can we go, Roger?” appealed Elaine Newton anxiously, her soft gray eyes fretful, her small hand grasping his sleeve. “No, Corvo’s agents would be sure to find us in any of the planetary colonies, sooner or later,” Newton replied. “Then where is this refuge you speak of, if it’s not on Earth or any of the planets?” demanded Simon Wright, his lenslike artificial eyes boring questionably into Newton’s face. Simon Wright was not a man. He had once been a man. He had once been a famous, aging scientist whose body was racked by an incurable disease. To save his brilliant brain from death, Newton had acceded to the old man’s plea and had removed Wright’s living brain from his body and had encased it in a serum-case in which it could live indefinitely. THE case stood now on a table beside Newton and his wife. It was a transparent metal box a foot square. Made of a secret alloy, it was insulated against shock, heat and cold, and contained a tiny battery that could operate its compact perfusion pump and serum purifier for a year. Set in its sides were the microphones that were Simon Wright’s ears. In front was the resonator by which he spoke, and his artificial lens-eyes, mounted on little flexible metal stalks he could turn at will. In that box lived the greatest brain in scientific history. “Where can we find refuge, if not on Earth or any of the planets?” Wright repeated in his rasping, metallic voice. Newton went to a window and drew aside the curtain. Outside lay the peaceful, nighted hills, washed with silver by the effulgent rays of the full moon that was rising in glorious majesty. The white disc of the great satellite, mottled by its dark mountain ranges and plains, shone starkly clear in the heavens. Newton pointed up to it, as girl and brain watched wondering. “But our child—” he objected, a frown on his face. Ten weeks later, Newton, Elaine and Simon Wright—man, woman and Brain—sailed secretly for the moon in a big rocket crammed with scientific equipment and supplies. Upon the moon, beneath the surface of Tycho crater, they built their underground home. There a son was soon born to the man and woman—a red-haired baby boy they named Curtis. And there in the laboratory of the lonely moon home, a little later, Newton and Simon Wright created their first artificial living creature—a great metal robot. GRAG, as they named the robot, stood seven feet high, a massive, man-shaped metal figure with limbs of incredible strength. He had supersensitive photoelectric eyes and hearing, and a brain of metal neurons which gave him sufficient intelligence to speak and work, to think and to feel primitive emotions. But though Grag the robot proved an utterly loyal, faithful servant, he was not of high enough mentality to satisfy Newton. The biologist saw that to create more manlike life he must create it of flesh, not of metal. After more weeks of work, they produced a second artificial creature, an android of synthetic flesh. This synthetic man they named Otho. He was a rubbery, manlike creature whose dead-white synthetic flesh had been molded into human resemblance, but whose hairless white head and face, long, slitted green eyes, and wonderful quickness of physical and mental reactions, were quite unhuman. They soon found that Otho, the synthetic man, learned more quickly than had Grag, the robot. Elaine’s face lit with pure happiness. “Corvo won’t dare bother us, when we return as supreme benefactors of humanity,” her husband said confidently. He turned to the two unhuman beings. When the huge metal robot and the rubbery android had gone out through the airlock chamber to the lunar surface, Elaine Newton brought her infant son into the big laboratory. She pointed up through the glassite ceiling which framed a great circle of starry space. There amid the stars bulked the huge, cloudy blue sphere of Earth, half in shadow. Little Curtis Newton looked up with wise gray baby eyes at the great sphere and stretched his chubby arms. Newton heard the airlock door slam. He turned surprisedly. “Grag and Otho—are you back so soon?” the voice of Simon Wright rasped with sudden alarm. Elaine uttered a cry, and Newton paled. Four men in space suits, carrying long flare-pistols, stood in the doorway. The face of their leader was revealed as they took off their helmets. It was a hawklike face, darkly handsome. “Victor Corvo!” Newton cried appalledly, recognizing the ruthless man who had coveted his scientific discoveries. Newton read death in the man’s triumphant black eyes. And the sight of his wife’s bloodless face and horrified eyes galvanized the young biologist into desperate action. He sprang toward a locker in the corner in which his own flare-guns were stored. But he never reached it. Jets of fire from the pistols of Corvo’s men hit him in mid-air and tumbled him into a scorched, lifeless heap. Elaine Newton screamed, and thrust her baby onto a table, out of range of the guns. Then she leaped to the side of her husband. “Elaine, look out!” cried the Brain. She did not turn. The flare from Corvo’s pistol struck her side, and she toppled to the floor beside her husband. Little Curtis Newton, upon the table, began to whimper. Corvo ignored him and strode past the two still forms toward the square metal serum-case that held Simon Wright’s living brain. He looked triumphantly into the glittering lens-eyes. Two figures burst into the laboratory at that moment. Corvo and his men spun, appalled, unable to believe their eyes as they stared at the two incredible shapes who had entered. The huge metal robot and the rubbery android! They stood, their unhuman eyes surveying the scene of death. With a booming roar of rage from the robot, a fierce, hissing cry from the synthetic man, the two leaped forward. In less than a minute, Corvo and his three men lay horribly dead, their skulls smashed to pulp by the robot’s metal fists, their necks broken by the android’s rubbery arms. Then Grag and Otho stood still, gazing around with blazing eyes. The robot put the Brain down by the two scorched forms. Wright’s lens-eyes rapidly surveyed the bodies. With ponderous metal arms, the huge robot raised the dying girl to a sitting position. In a moment she opened her eyes. Wide, dark and filled with shadows, they looked at the Brain and robot and android. It was Otho who sprang to obey. The android gently set the whimpering infant down beside her. The dying girl looked down at it tenderly, heartbreaking emotion in her fading eyes.